Don’t forget that July 14th is France's national day, Bastille Day. So named because it commemorates the start of the French Revolution when common people stormed the medieval Bastille fortress in protest at excessive taxation and poverty. Like our national day, Bastille Day is largely an excuse to party, relax and enjoy good food and wine with your friends - something the French have had much practice at. In Paris a huge military parade is held every year, showcasing their troops and aircraft. 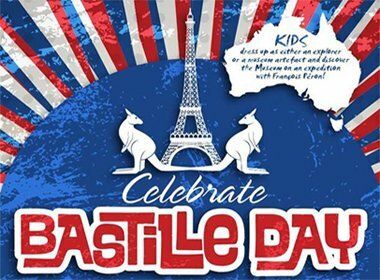 As French people have dispersed around the world local communities often hold their own celebrations, and in Adelaide the French Consulate has organised our very own Bastille Day celebrations at the South Australian Museum. As Bastille Day falls on a Monday this year, this family event here will be held on Sunday July 13th. Guests will be able to sample French champagne, classic canapes, and will be entertained by live French music. It's a family event, so kids are encouraged to come along dressed as either an explorer or a museum artifact and follow explorer François Péron on a voyage of discovery of plants, insects and mammals in the South Australian Museum. Sydney will also celebrate Bastille Day in Style with numerous events that the expatriate community will no doubt organise with classic French elegance. One such event is Bastille Day in The Rocks which boats a huge program of Francophile DJ’s, events, food and music. An event not to miss. To book tickets or to view the program go to Bastille Day Sydney website for more information. Entry for Bastille Day costs $20 per adult, and for children under 12 entry is free. You need to book online to ensure your place at the celebrations, so do it early to ensure you don't miss out. For more information see the French Consulate's website.